Did you know that the Latina/ Latino small business market is THE FASTEST growing small business segment in the United States? It is. Did you know that the size of this market tops over 1 Trillion Dollars? It does. 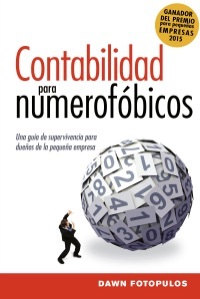 This is why Accounting for the Numberphobic in Spanish is going to change lives in all communities. Do you know a Latino business owner and want to bless them? Buy them this book! Let’s double small business success rates with just a little knowledge from this book that has already saved thousands of businesses from bankruptcy. Tus Tres Maestras are on the mission with us to teach, coach business owners to realize their dreams. Camino Financial is on the mission with us to mainstream businesses that have earned that right. Here’s our mainstage presentation at Scaling New Heights. Are you on the mission with us?